I know I’ve mentioned my me-time and my TV nights on this blog before, but I’ve never really talked about what I eat on those nights. 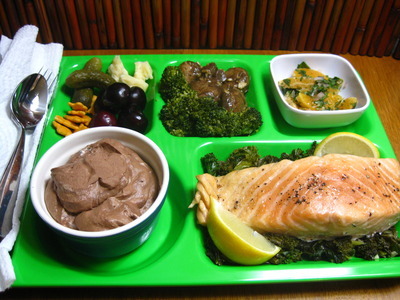 Well, Thursday night is a big TV night for me, and I’ve recently taken to using these divided/sectioned melamine trays I bought at Target on super-clearance a few years ago to serve myself a TV dinner. Reinvented. Most everything on the tray is homemade, and it’s a very filling, nutritious meal – dessert included – that I can wrap myself in my Snuggie (Christmas gift and I love it! ), put a couch pillow on my lap and then lay the tray across that and eat while I watch TV. I love it. 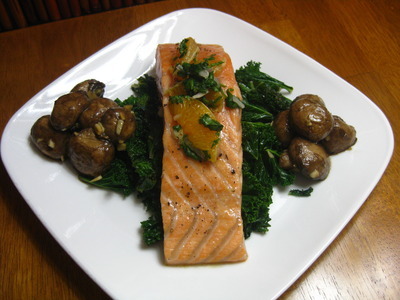 The first night (non-TV-night), I served it on a bed of lightly cooked kale, alongside garlic marinated mushrooms and topped with clementine relish. 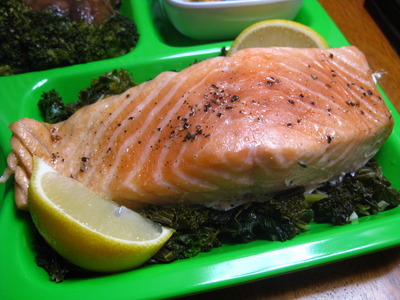 First up: a piece of simply roasted salmon (kosher salt & black pepper), on top of a bed of kale, with two wedges of lemon. 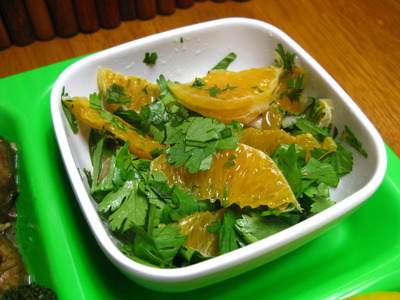 Did you know that citrus (vitamin C, really) helps you absorb iron from leafy greens? No? Well, it’s helpful if you’re cutting red meat out of your diet, to know such things. The clementine relish that I whipped up to top my salmon! 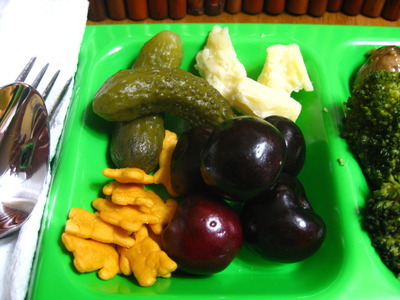 Appetizer compartment: Annie’s Cheddar Bunny crackers, a few cherries, two cornichons, and a bit of Fiscalini Bandaged cheddar (yum). Great for picking at during the beginning of the meal. 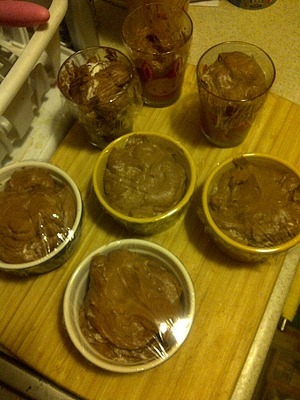 Homemade chocolate custard! I was really excited when I made this. 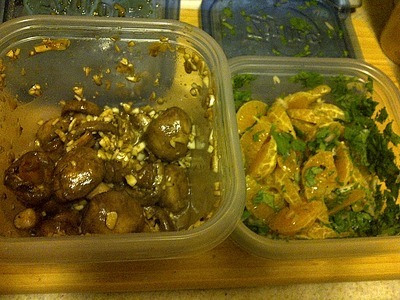 Here are the garlic marinated mushrooms and clementine relish being prepped and made. Mix everything together and let sit in the fridge for a few hours or however long until you’re ready to eat it. 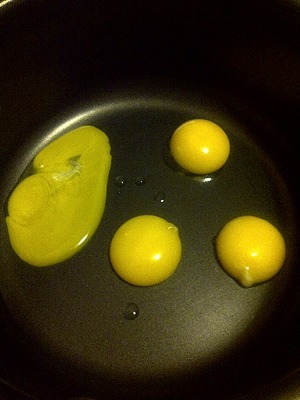 I figured out quickly how to separate yolks and whites for the next recipe. I think I did an OK job for my first time. Can someone tell me what to do with the whites leftover though? I put them in a container in the fridge and have no idea how long before they go bad, or what to do with them. Help…? 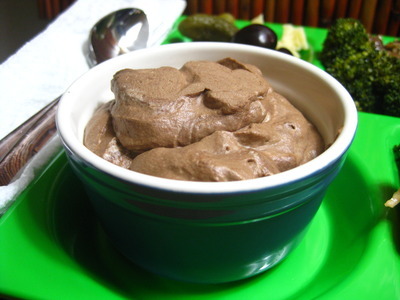 Chocolate custard! Well, they call it something else, and if you have a good eye, you’ll notice some white splotches in there. Mostly because I didn’t want to overmix/deflate the custard, so when I was folding in the whipped cream, I stopped pretty early. Not really a good idea for aesthetics and also because it wasn’t mixed thoroughly, some parts of the chocolate custard were thicker and almost chewy, since they’d had no whipped cream incorporated. Ah well. The recipe comes from Everyday Food: Fresh Flavor Fast (affiliate link), but is posted here (with minor modifications). In a medium saucepan, whisk together egg yolks, 2 tablespoons sugar, and 3/4 cup heavy cream. Cook over medium-low heat, stirring, until mixture coats back of spoon, 3-4 minutes. DO NOT BOIL. Remove from heat; whisk in melted chocolate and vanilla until completely smooth. Strain through a fine sieve into a bowl, discarding solids. Refrigerate, covered, until cool. Beat the remaining 1 3/4 cups heavy cream and 2 tablespoons of sugar until stiff peaks form. [Note: I used my immersion blender with the whisk attachment. You know how to whip cream, right? You’re not SWSNBN. You can use a metal whisk or your hand mixer or an electric mixer, whatever, as long as you get the whipped cream to give up.] Stir one-third of the whipped cream into the cooled custard mixture, then use a flexible spatula to gently but thoroughly fold in the rest. Spoon into serving dishes; chill, covered, at least one hour and up to 3 days. 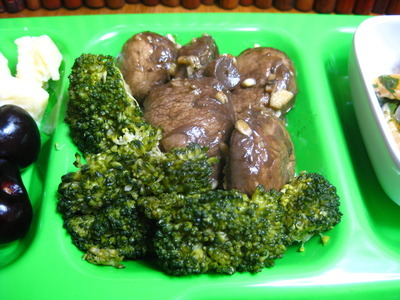 Remove from refrigerator about 15 minutes before serving. If I may be completely honest, while I received positive comments on the end product, and it was certainly tasty enough, there was just too much work and too many dirty dishes for a product that in the end, tastes good, but not amazing. I sieved that stuff and no solids remained! Why did I have to then spend 10 minutes scrubbing and rinsing that stupid thing [I hate sieves; they are great for their job but take an ungodly amount of time and effort to clean properly]? The chocolate custard was good, and BF was duly impressed that I made that (because I don’t generally make sweets), but … *whispers* I could have had the same result from a box, I think. It was just not mind blowing nor simple enough to deserve the process it required, if that makes sense. Ah well. The other two items were too simple to really require a recipe: the broccoli (which I didn’t actually make, they were leftovers) and the kale, which was basically olive oil into the bottom of a pan with sliced garlic, then throw the chopped leaves in there, stir, salt, lemon juice, voila, done. I purposely undercooked them a little bit the first time because I knew I’d be reheating them repeatedly throughout the week, so they were perfect in the middle of the week and just the slightest bit overcooked by the very end bit. No big deal. I look forward to continuing to reinvent the TV dinner for my TV nights! Any suggestions or requests as to what I make and put in the tray? What do you eat as a special treat for when you watch TV? $20 worth of chocolate custard? i am sure the egg whites are fine in the fridge for a couple days. egg white omelette or frittata? or whip em up and make meringues, similar technique to whipping cream, i can draw you a diagram if need be. So these egg whites are no longer good I guess? Hmm, roasted is not how I prefer my salmon (Well, all my fish really). I love it pan fried or grilled to get that nice blackened look and crunchiness on the outside. All in all it looks really good Yvo. Thanks! I actually don’t like pan frying salmon or other fish with skin on because it tends to stick and I’m scared of that. However I have this one recipe – mango crusted salmon – that makes a great crunch on the outside of the salmon (it’s pan fried), but now I wonder if I can use that in the oven for some crunchiness without needing to fry it… hmm! I love that tray. (even in neon green) The meal looks fantastic! I often plan on eating more fish, and a few weeks later that plan is over. I don’t know why I have such an aversion to cooking it or ordering it in a restaurant. I really do like it. Thanks! And the same for me. It’s a good idea that quickly gets tossed by the wayside. I think I dislike buying it because I have to cook it almost immediately, and I’m more the type that buys stuff, thinks about it, might make it a few days later or might shove it in the freezer (meats). 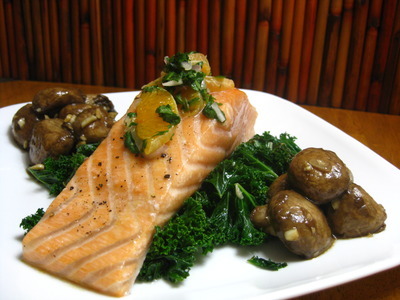 With fish, it’s so delicate and so much more expensive than meats! Egg whites freeze really well and last for a long, long time. Save for another day when you need only egg whites for recipes, especially baking recipes. Oh and to keep fish skin crispy without sticking in a pan: get pan really freaking hot, pat fish down with paper towel to remove moisture. Add oil, then fish. Do not touch the fish or move it in any way. Let the heat crisp it up and it should just come off easily when it’s fully caramelized. This is much easier with a non-stick pan if you have one. Though, I tend to find non stick pans do not give a good enough sear for me. YES! Throw them out! In fact, do it in a sealed container so your home doesn’t smell up. Oh, for next time, if you have an ice tray (or even your silicone cups), freeze the individual egg whites in there so you have perfect servings every time. Me thought it was ice cream at first. Oh well. Looks like a good meal to enjoy in front of the Tube. oh boy… this makes me hungry….